6. WHO WERE THE GEATS? This map helps us to understand where Briton's defenders, then invaders, originated after Rome's legions left Britannia undefended. Map online via Wikimedia Commons. According to Venerable Bede, the Angles came from "Angulus," near today's Danish-German border. In fact, Schleswig-Holstein (the northern area of modern Germany), still has a district called Angeln. The Saxons came from the coast between the Elbe and Weser River valleys. A third group of foreigners who would soon populate Rome's former province - the Jutes - resided north of the Angles in Jutland (modern Denmark). At first, the Britons were able to pay their foreign defenders. But as more and more Anglo-Saxons descended on Britain, compensating them became increasingly difficult. Soon the immigrants "took" what was not theirs. As word about good-land-for-the-taking reached tribesmen still living in their own lands, hoards of uninvited "barbarians" reached Britain's shores. Their intent was not to help the Britons resist the Picts and Scots. Their intent was to settle the land themselves. Some of their early settlements, based on archeological evidence, incorporate towns which are still important today. 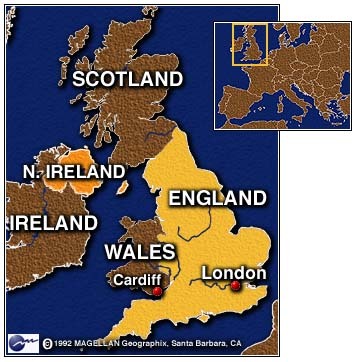 Largely undefended, remaining Romans and native Britons fled to modern Wales and Cornwall. It wasn't the first time Saxons had invaded their land. That had happened as early as 409 A.D. But this time, with no legions to protect them, resistance proved extremely difficult. Saxons attacked the southern part of Britannia from northern Germany, as did Angles and Jutes. When so much of the south was occupied by Angles, the area was called Angle-land (scroll down 20%) from which the country - England - later took its name. Celtic tribes, who had caused Britons to seek help in the first place, continued to inhabit the northern part of the territory. Fierce as they were, they remained independent during this time frame. Invited "Anglo-Saxon" defenders had become unwelcome invaders who were in the country to stay. As Britons resisted, the land descended into chaos. Bos, Carole "INVADING ANGLO-SAXONS" AwesomeStories.com. Nov 01, 2007. Apr 20, 2019.